The ULYSSES Ensemble, created by the ULYSSES Network, is an ephemeral chamber ensemble of thirty young European performers ages 18 to 30 who have been selected especially for the occasion. Together they will tour five* major European contemporary music events and have the opportunity to work with leading conductors, composers and performers on key repertoire and new works. 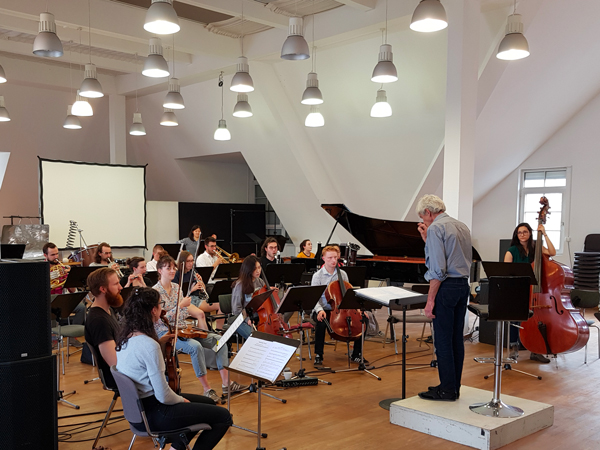 The first stop of the ULYSSES Ensemble is Frankfurt/Main (DE) where the ULYSSES Ensemble members meet and cooperate with the members of the IEMA-Ensemble (International Ensemble Modern Academy). Since 2012 IEMA has invited young composers recommended as part of the ULYSSES Network to develop new works as part of a try-out process involving several stages. During a first try-out, composers can experiment with and develop their compositional ideas in conjunction with the musicians. In a second phase, the pieces are then thoroughly rehearsed and given their world premieres. Both of these phases are accompanied by the acclaimed conductor Lucas Vis. The composers work with the current IEMA Ensemble. This ensemble is formed by the students of a given year of the Master’s Degree course of the International Ensemble Modern Academy at the Frankfurt am Main Academy of Music and Performing Arts. As part of this Master’s degree programme, young artists (instrumentalists, conductors, composers, and sound directors) work together as an ensemble for an entire year with the members of Ensemble Modern on the diverse repertoire of contemporary solo literature, chamber music and ensemble works with conductor. This year, IEMA invites not only the composers Javier Quislant Garcia and Mikolaj Laskowski at the recommendation of the ULYSSES Network, but also expands its pool of musicians by including the members of this year’s ULYSSES Ensemble! 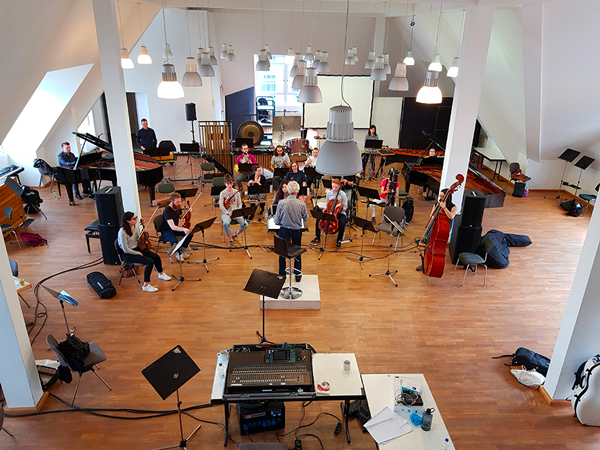 The members of the ULYSSES Ensemble were able to apply for a total of four academies of the Ulysses Network: that of Divertimento Ensemble in Milan, the academy ManiFeste at IRCAM in Paris, in Royaumont, and IEMA (in cooperation with the Gaudeamus Muziekweek in Utrecht). Because of our two-part project form, IEMA is the starting and the endpoint for the ULYSSES Ensemble this year. The first meeting of this ensemble took place from April 16-18 at our headquarters in Frankfurt – this is where the 2018 ULYSSES Ensemble formed and also met the IEMA Ensemble 2017/18. It was fascinating to witness how two ensembles with a very international cast interacted within themselves and with each other, displaying a natural, highly professional attitude – a “concert” in the very best sense of the word! The try-outs for the new works by Laskowski and Quislant were very valuable and insightful for both composers, according to their own assessment, and they also took advantage of the time to clarify instrument-specific issues with individual musicians during these try-outs. Laskowski will write a work for the 14 musicians of the ULYSSES Ensemble, while Quislant contributes a work for a larger instrumentation of 21 musicians, which will be performed by both ensembles together. Another shared work is “Vaporised Tivoli” (2010) by Anders Hillborg: the first rehearsals for this have also already taken place. The IEMA Ensemble completes the programme with a world premiere by the composer Yongbom Lee. "The composers are always discovering new sounds, truly new music. This searching for sounds together with the musicians is an opportunity that seems like paradise to composers. 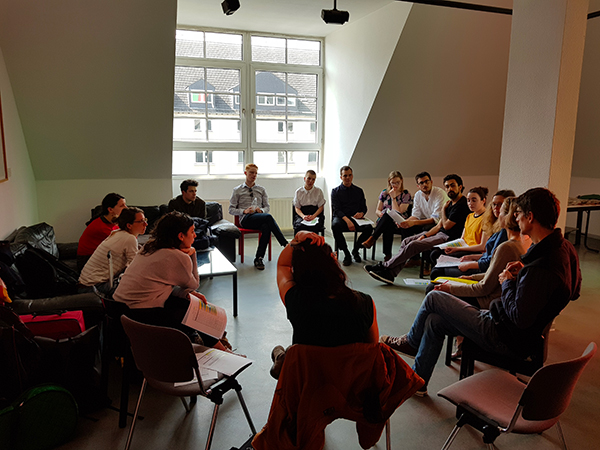 Yesterday, the ULYSSES musicians met for the first time as an ensemble; they also met the students of the International Ensemble Modern Academy for the first time. We rehearsed a very difficult work, with an incredible amount of energy; and given this enthusiasm, we already reached a high level on the very first day." "The ULYSSES Network offers an opportunity to work with a large ensemble of 20 musicians from all over the world; that means building different human relationships. To young composers, the ULYSSES platform offers an opportunity to work with such excellent instrumentalists such as IEMA and the ULYSSES Ensemble." "It’s the chance to discover new composers, a new way of making music with other musicians. I’m really happy to be here and discover how the IEMA works. I was really impressed by the first reharsal yesterday. the general energy we had, was already really high. I think the next stops as ULYSSES Ensemble will be just amazing, because if we start like that at first rehearsal, in the next stops we will really discover new ways of playing."